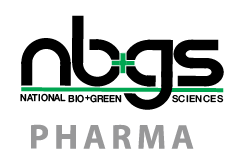 National Bio+Green Sciences LLC (NBGS) is located in Central Jersey, the Pharma Capital of the world. NBGS operates an FDA Registered Facility and are a contract manufacturer, labeler and supplier of medical products and devices. Whether you are looking for OTC or RX products, NBGS can surely add value. Our specialties include RX medical silicon scar and keloid pads, topical scar and keloid gels as well as affordable OTC compact nebulizers, nutraceuticals and oral care products. At NBGS, we are a multifaceted formulation house and contract manufacturer. NBGS’ food scientists and chemists can help clients develop a product, whilst our design team can help with product and package design, and our in house engineers can help develop or repurpose equipment to fit the clients needs. We can even spec and build the machinery that is required to manufacture and package the items. For special clients NBGS can even contract package for them. If you have an idea, chances are NBGS can help make it a reality.